The Virginia Cooperative Extension is offering free training and information sessions to help increase awareness of the threat of the spotted lanternfly, an invasive insect that can have a devastating effect on agricultural crops. The educational sessions are designed to equip homeowners’ associations, farmers and others with the information they need to help prevent the spread of the invasive insect. Spotted lanternfly feeds on Tree of Heaven, Ailanthus altissima, along with more than 70 other plants including crops such as grapes, peaches, plums, cherries and hops. 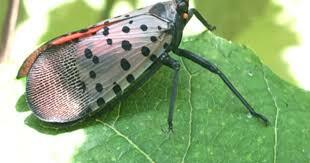 Officials say early detection is vital to managing the spotted lanternfly. Through the trainings, residents can learn how to identify the spotted lanternfly in its different life stages, destroy its egg masses on tree trunks and other surfaces, distinguish Tree of Heaven from other look-alike trees and remove female trees from the yard. The insect’s lifecycle includes a single generation every year. Adult spotted lanternflies usually die at the onset of winter, but their egg masses can survive below-zero temperatures. Egg masses typically include 30 to 50 jellybean-shaped eggs in neat rows covered by a waxy substance that looks like mud. The egg masses can accumulate on tree trunks and other surfaces from October to early spring, creating the possibility that infested material or items containing egg masses could be moved inadvertently to a new location. To request a training session or for more information about the spotted lanternfly, contact horticulturalist Beth Flores-Sastre of the Virginia Cooperative Extension, Loudoun County at 703-737-8978 or flores69@vt.edu. Anyone who sees a spotted lanternfly or an egg mass is encouraged to report it to the Virginia Cooperative Extension at 703-771-5150. More information, including links to a variety of informational resources about the spotted lanternfly, is online at loudoun.gov/spottedlanternfly.